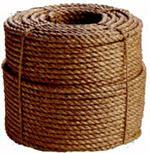 The strongest of all natural fiber ropes. Our manila rope has a colored marker. One of the strongest synthetic fibers, offering superior elasticity and excellent resistance. Premium grade U.V. stablized polypropylene fiber: versatile, ecnonomical, lightweight floats. Premium grade U.V. stablized polypropylene fiber: versatile, economical, lightweight floats. High tensity polyester fiber wrapped cover over polyolefin core yarns. Tuff Stuff, MANGB, 12" Gin Block Pulley Sheave Reel Wheel Working Load Limit 1,000 LB Manila Rope Size 3/4" - 1"
Tuff Stuff, MANGB, Outside Diameter 12" Gin Block Wheel Working Load Limit 1,000 LB Manila Rope Size 3/4" - 1". Gin Blocks for Manila Rope For light housing use by Roofers and Contractors. Each furnished with drop forged swivel latch hooks.